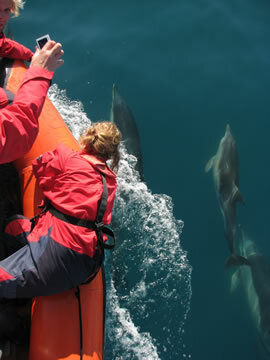 Common dolphins riding the bow of CRRU research boat "Ketos". 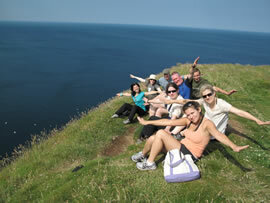 Enjoying the sunshine and gannets at Troup Head. The sunsets in Gardenstown can be breathtaking. You'll have a fantastic time with the CRRU and meet some really interesting people! 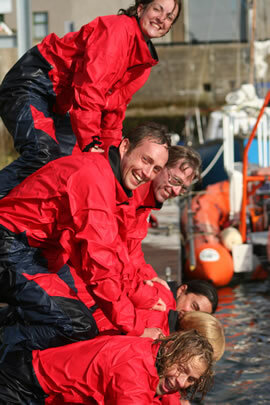 Each year the CRRU offers a number of unique opportunities for a seasonal corps of trainees to join us in Gardenstown as contributing members of the research and rescue team. The courses are run in the form of an 12-day educational placement, and as a trainee with the CRRU you will have the opportunity to learn about the whales and dolphins of the Moray Firth and their dynamic marine environment first hand – working closely alongside a dedicated and knowledgeable team of biologists whilst at the same time providing crucial support for the organisation's research programme. As you participate in ongoing field studies, you will learn and apply the principles of field research design (accompanied by structured lectures and field tuition), undertake training in marine mammal rescue techniques and gain a personal understanding of the conservation issues which drive the research, rescue and conservation activities of this small but dedicated charity. The most important requirements for any participant are enthusiasm, the ability and willingness to learn and work under often difficult (but rewarding) field conditions and the open-mindedness and sense of humour to work, live and communicate with other people of mixed nationality and background. Please also note that, due to the nature of the work, participants will need to be both physically fit and healthy and, as a guideline, should be able to walk along steep coastal paths to reach land observation points. The research unit providing this opportunity is not a professional tourist organisation but a well-organised team of research scientists. Therefore, as part of a working team, you will be expected to participate in all activities of the day, including your share of basic domestic duties such as cooking, cleaning and maintenance. Flexibility is also required with respect to sleeping arrangements, as single bedrooms or sleeping facilities only for couples are not usually available. Why should you join this programme? For a truly unforgettable experience at the very least. Apart from the support you will be giving the project, this will be an extraordinary learning experience for you. You will learn and apply new skills, experience new cultures, make new friends and learn much about yourself and others in the process. Students and recent graduates may see this as an opportunity to acquire valuable experience with marine mammals and even gain course credits. The cost for an 12 day internship with us in 2019 is £1,250 [for a currency converter, click here]. This will cover you for full board (all your accommodation and food costs), your full equipment needs and ALL associated field costs, boat survey trips and outings during your stay with us. You'll simply need to arrange your own travel itinerary to us in Banff in NE Scotland (nearest airport Dyce, Aberdeen, approx. 1½ hours from the field base by coach) plus any personal spending money. 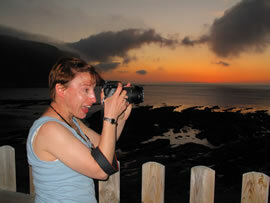 For more Marine Conservation jobs and courses see environmentjob.co.uk. To view our Scrapbooks, click HERE.